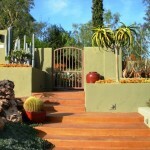 The sage and pumpkin-colored entry garden hints at the glories inside the gate! 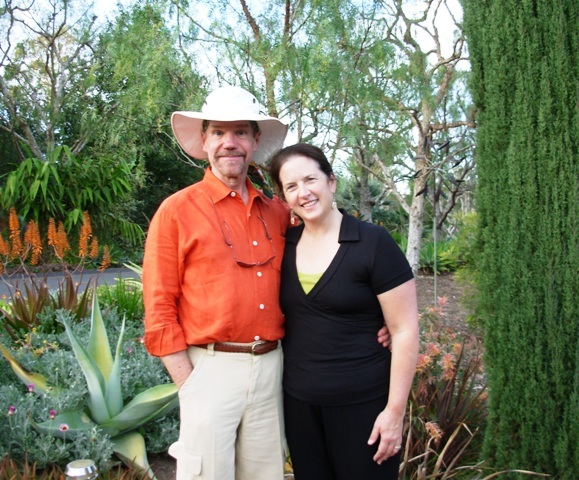 Patrick donned his “Aloe Orange” linen shirt so he could match his garden! I think I’ve established my willingness to drive, fly, walk, hike, take a train or ride a bicycle to get to a garden destination that summons me. Last Sunday is a good example. I was staring at an invitation from Patrick Anderson and Les Olson, owners of a cactus and succulent garden extraordinaire (not to mention the most majestic dining pavilion in the universe – you can find it on page 126 of Stylish Sheds and Elegant Hideaways, in my chapter entitled “Extravagant Gestures”). This was the third time Patrick and Les extended an invitation to their winter party. And it was the first year I wasn’t traveling out of state. 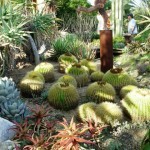 I first met the men in 2005 when they hosted a Pacific Horticulture Open Garden event for donors. 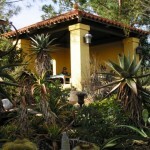 I returned with Bill Wright in the fall of 2006 to photograph the dining pavilion and garden for our book. Practically hyperventilating with excitement about shooting such a cool setting, we rose before dawn and tiptoed out to the garden to get the very best early-morning shots (our task was eased, thanks to the offer of lodging in Patrick and Les’s guest bedrooms). 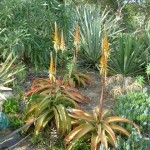 Last weekend, I desperately wanted to visit their exotic botanical wonderland in San Diego County. Not only did I want to say hello to my “Shedista” friends, but I knew the aloe display would be at its ever-lovin’ peak of perfection. Who cares that going to the party meant a 300-mile round-trip drive on a Sunday afternoon? Husband and sons all fed and settled into their own activities, I hopped in the car after church and hit the freeway, heading south. Oh what a treat I had! This is the very type of excursion that convinces a California newcomer that all her former Seattle blossoms have serious competition for her affections. 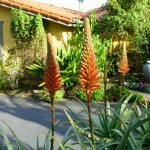 It’s tough to yearn for my hydrangeas, peonies and lilacs when the intense, architectural aloe blooms are in my face. 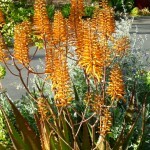 Orange, gold, salmon, yellow, apricot, terracotta pink – saturated hues of the sun – on display like colorful fireworks hovering at the tips of erect stalks. 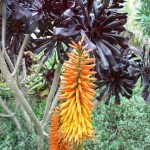 Each bloom is composed of tubular flowers tightly arranged around the stem. And what diversity! 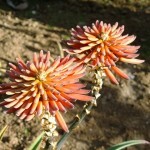 Some are shaped like a red-hot poker Kniphofia bloom; others are short and wide, in the shape of a spinning top. Some tilt upwards; others are arranged like rays of the sun. These flowers are winter’s antidote to gloom. That’s not all Patrick and Les have in their 2-acre garden. It is certainly an “elegant hideaway,” although a very distant relation to a shed. 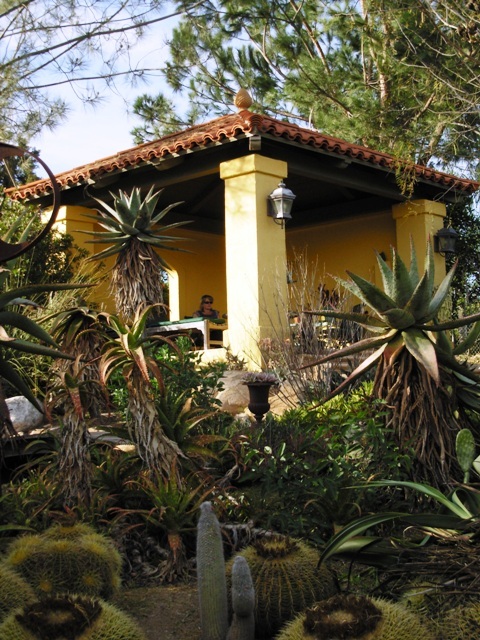 Not a wimpy latticework gazebo, but a bold, manly garden house that can accommodate a quiet dinner for two or a raucous gathering of a dozen friends. 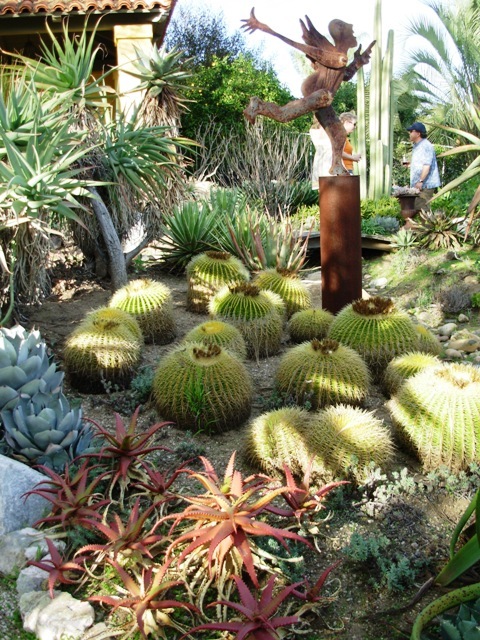 Patrick seized the chance to invent his own plant world here, spending the past fifteen years shaping the landscape with unusual spiked, whorled, spherical, and fan-shaped cactuses, along with succulents representing a color spectrum from maroon to bronze to silvery blue. “Every inch of this property is plantable if I ever get around to it,” he maintains. The garden’s finishing touch: a golden, open-air pavilion where Les and Patrick seek haven from heat and sun. The neighbors jokingly call it the Taj Mahal, but the opulent pavilion situated at the highest point of Patrick and Les’s property has exactly the right degree of dramatic presence their flamboyant desert garden needs. 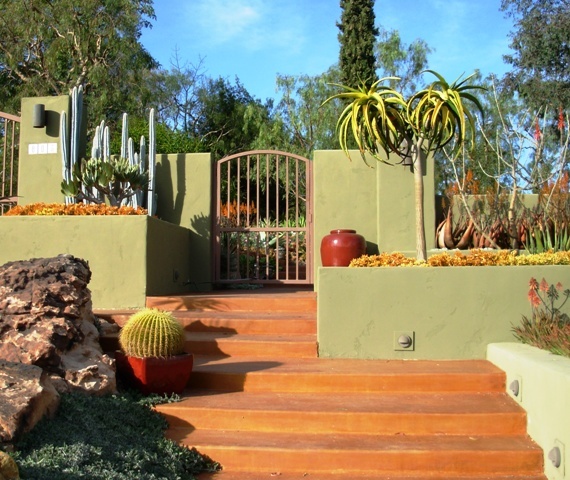 Together the structure and plant collections embody Patrick’s two loves: theater and horticulture. 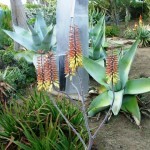 Patrick fell in love with aloes and other succulents and cactus forms years ago, as a volunteer at the famed Huntington Botanical Gardens near Pasadena. 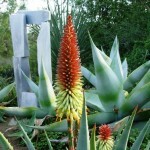 He learned to grow and propagate many varieties, including aloes. And I suspect his design sensibility (he studied theater and costume design in college) was also honed as he spent time in the Huntington’s desert collection. 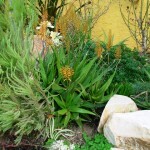 More than 200 varieties of aloes unify the garden. 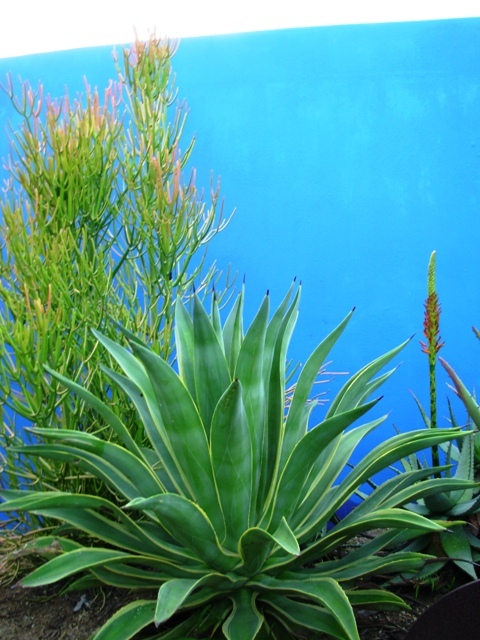 Against the pointed and thorny blue-green leaves, the brilliant aloe blooms remind visitors that there’s nothing dull about the desert floral palette. 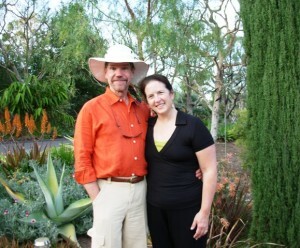 Thank you, again, Les and Patrick, for sharing your garden with me and with so many of your admirers! It was a long drive. But an inspiring day. And I am certain that by next January, when another invitation to “Sweets, Savories, and Succulents” arrives in my mailbox, I will clear my calendar and make the drive again! P.S., One amusing photograph I just had to add. 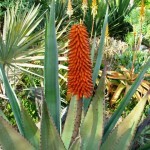 For anyone who has been up close and intimate with an aloe, agave, cactus or other thorny plant. 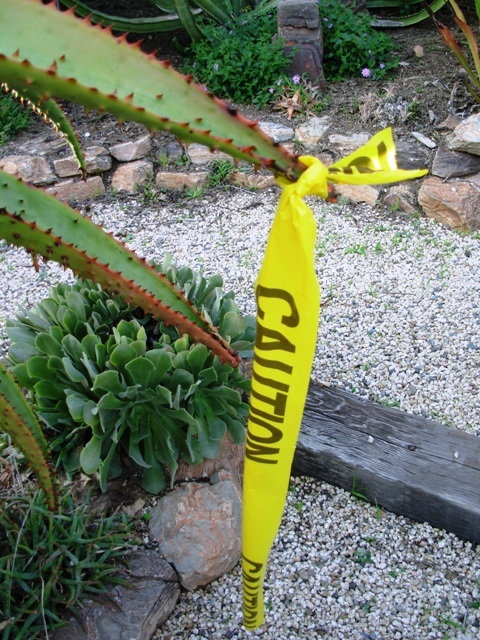 . . the “Caution” tape was a reminder of how careful one must be in a desert garden! 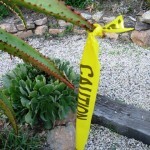 This entry was posted on Saturday, January 24th, 2009 at 9:10 pm	and is filed under Creativity, Gardening, Plants, Shed Glossary, Sheds & Havens. You can follow any responses to this entry through the RSS 2.0 feed. You can leave a response, or trackback from your own site. 300 miles on California freeways on a Sunday is true devotion! 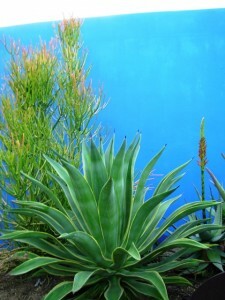 But the plants, the shapes, the colors…and you’re in shirtsleeves! Winter indeed! Debra, I was at Patrick’s that day too—darn, somehow I missed you. I would have loved to say hello. 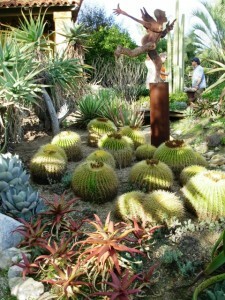 I would love to have a succulent garden like patrick’s. LOVE this post. 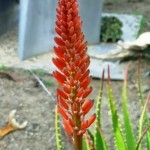 I have lived in Los Angeles all my life and sort of took aloes, succulents, etc for granted. I was used to seeing them tucked into a landscape as an afterthought. 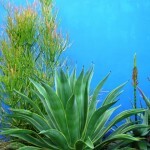 It wasn’t until I helped a neighbor put in a Southwest garden that the beauty of these plants really hit me. When designed correctly, they look magnificent! 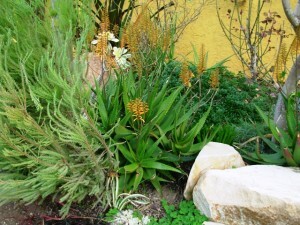 Thank you so much for your tale and photos of your visit to Patrick’s garden! 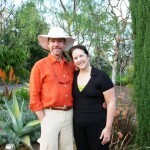 I was unable to make the garden party this year & was so happy to find your story of the event! It is just as I remember it from the last time I visited. Beautiful! Enjoyable read!! 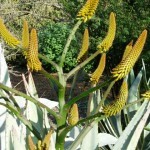 Beautiful blog, and what a garden – thank you!